So now that we’re all on the same page that fat isn’t Satan, the devil or just plain bad , let’s talk about foods without fat—those health foods marketed as being fat-free. What is a fat-free food? Fair enough, and this is when you need to dive a little deeper. Say that label is on a rice cake. Rice cakes are basically just puffed rice, so it makes sense that they have no fat in them. 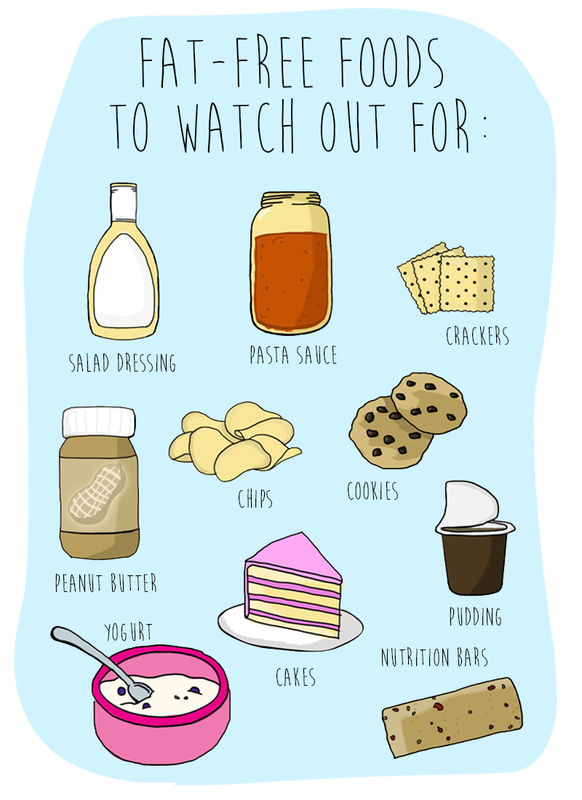 But say you see that label on a salad dressing, a pudding, a cookie, a cracker, a cake, or a nutrition bar. If you were to make any of these foods at home, you’d probably add some oil, butter, nuts, or seeds—all sources of fat. In order to replace the fat in those foods, food manufacturers have to add something else. And that something is usually sugar. To replace the mouthfeel, texture and taste of fat, food scientists use flour, salt, emulsifiers and texturizers. When you replace the fat in a food with sugar, you reduce the satiety factor—how full and satisfied you’ll feel after eating it. Sugar has the opposite effect on your blood sugar that fat does—sugar spikes your blood sugar, and ends in a crash, leaving you with even lower energy and hungry as ever. Replacing fat with other ingredients often results in a less appealing product—both in taste and appearance. And if it’s not satisfying, you’re likely to eat more of it. How many grams of sugar per serving? Is it higher than most other products of the same kind? (Chips vs chips, crackers vs crackers). If your goal is to lose weight or improve your health, don’t assume that a fat-free food is naturally good for you. Stock up on whole foods, and when choosing a packaged food, choose those with healthy fats—not fat-free.